For anyone fortunate enough to have taken a French class in high school, then you know only too well that the pansy gets its name from the word “Pensee”, which means “thought”. The pansy got its name because it looked a bit like a human face. And during the month of August, it looks as if it’s in deep thought. In this piece, the ornate vase holds a colorful array of a careful arrangement of flowers, which are very pleasing to the eye. The vase is set inside a leaf border which complements the overall design. The masterful and harmonious use of color as well as its exquisite detail is typical of the Belgian expertise in tapestry making. 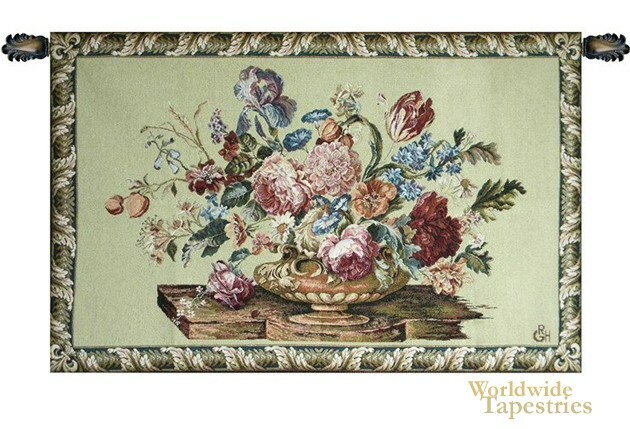 This tapestry “Pensee” comes backed with a lining and has a tunnel for easy hanging and display. Note: tapestry rod and tassels, where pictured, are purchased separately.